We throw out everything. It’s practically part of the human genome. Clothes, phones, couches, no matter the item, if it can be thrown away, it will surely reach the landfill. And it’s even worse when we get together and party. With ArtPrize comes a wave of plastic cups, smeared napkins and myriad of other refuse. But a four-way partnership stands to reduce any impending trash-pocalypse with SORT stations. You’ve probably seen the colorful three-bin SORT stations popping up at previous ArtPrizes. Individual bins to Separate Organic, Recyclables, and Trash give the program its acronymic name while promoting a sustainable event. Green bins hold organic materials that can be composted like food scraps, cardboard, paper products, and some biodegradable plastics. Yellow bins provide a place for recyclables like 1-7 plastics, metal, foil, cans, and glass. Lastly, a red bin collects landfill materials that can’t be recycled or composted. Volunteers run each station, aiding ArtPrize attendees in sorting out their refuse and maintaining the stations to create a clean, user-friendly SORT experience. Anyone age 13 and above can sign up to volunteer here and help keep ArtPrize sustainable. Last year, 7.44 tons of recyclables and 3.62 tons of composted material were diverted away from landfills and 31.13 tons of trash were collected for landfill. Ultimately, 61% of material collected at SORT stations was diverted from landfills. This year, WMEAC aims to streamline the process to improve upon last year’s results. This year SORT stations will provide an educational role as well. 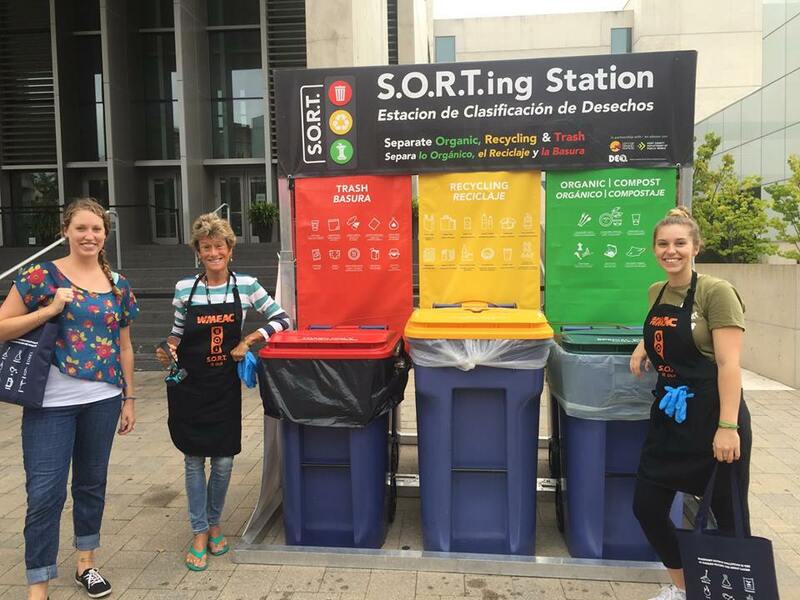 “Part of the SORT stations programming has been to place volunteers at different stations to help teach the Grand Rapids community basically what you can recycle, what you can compost, and what is actually trash,” Guyette said, adding that SORT stations attempt to normalize and proliferate the idea of sorting out refuse. “Hopefully in the coming years the community will be knowledgeable enough on how to compost and recycle and we won’t have to place volunteers, they’ll just know that these are SORT stations and this is how you use them,” she said. Guyette expects somewhere between 15,000 and 18,000 students to attend ArtPrize this year. While some people might just see a trio of multi-colored trash cans, Guyette sees an educational opportunity.